Space Required: 8ft. 3in. x 4ft. 5in. C3241 - Jaguar XKR GT3 - 1ea. 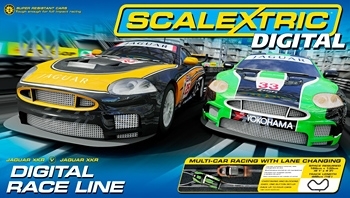 C3242 - Jaguar XKR GT3 - 1ea. C7039 - Straight Lane Change Track - 2ea. C8205 - Standard Straight - 6ea. C8206 - Standard Curve 45deg - 12ea. C8207 - Half Straight - 1ea. C7002 - Hand Controller - 2ea. 4 Car Digital Powerbase - 1ea. P9303 - Digital 15 Volt 4 amp Power Supply - 1ea.